MTI Lat Rats work through a set of 20x “Super Squats” during this Mini Study. 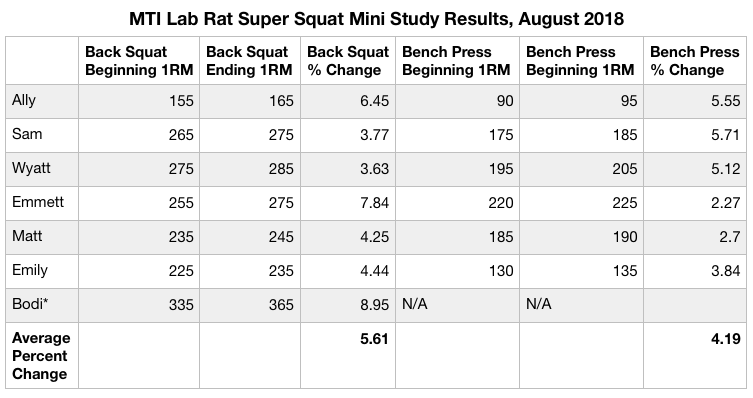 Experienced MTI Lab Rats showed an average 4.9% strength gain over two strength exercises following MTI’s “Super Squat” strength progression for 3 weeks within a multi-modal fluid periodization training cycle. MTI’s “Super Squat” progression is our implementation of the famous book, “Super Squats: How to Gain 30 Pounds of Muscle in 6 Weeks” by Dr. Randall Strossen. Dr. Strossen’s original Super Squat progression is classic, old-school strength training. 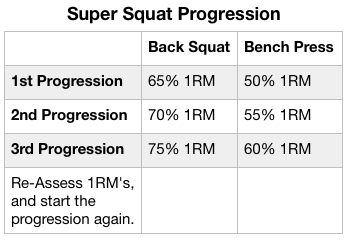 MTI’s version of the Super Squat strength progression uses percentages based off your 1-Rep Max and the completion of 1 Round of 20x reps of the Back Squat and Bench Press. The round will be completed without racking the bar, and with 2-3 big breaths between each rep. While taking the 3 deep breaths, the barbell is left behind the neck, across the shoulder for the back squats, and in the “up” position, elbows locked out, for the bench press. Twenty reps take athletes 3-4 minutes to complete. The combination of the reps, plus holding the weight between reps for the 3 deep breaths, is brutal. Below is a video of one of our athletes completing a set of 20 “super squats”. Dr. Strossen limited his “breath squats” to just the back squat exercise. At MTI, we’ve deployed this lifting and breathing progression to both back squats and the bench press. We’ll run this progression for three weeks before re-assessing 1 Rep Maxes (1RM). Each percentage progression is completed twice, and then the percentage increased to the next progression. These progression percentages did not come from Dr. Strossen, but rather experience completing Super Squats with MTI Lab Rats and athletes over the years. Note the difference between the back squat and bench press percentages. These are based on our experience deploying the progression with hundreds of athletes over the years – we’ve found the bench press “breathing” reps much more difficult for athletes to complete. 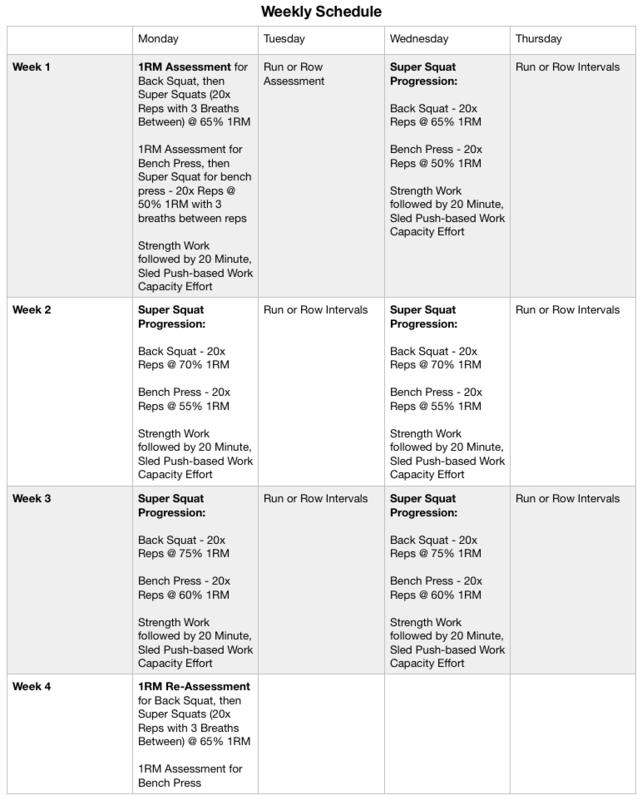 Our Super Squat Strength Cycle, and other full cycles where we’ve deployed the Super Squat progression, are typically 6 or 7 weeks long, and the progression completed twice, after a mid-cycle re-assessment. However, for this mini-study, we completed just 3 weeks of the progression. Veteran MTI Lab Rats completed the Super Squat progression for Back Squats and Bench Presses on Monday and Wednesdays. After completing the strength work, they completed a 20-minute, sled push-based work capacity effort. Tuesdays and Thursdays were spent completing endurance work – either running or rowing – for an upcoming study. Below is the weekly schedule. Over the years, we’ve seen between 10-15% overall strength gains using Big 24 progression over the course of a 6-7 week cycle, and I was somewhat surprised by these results. Why the smaller gains? 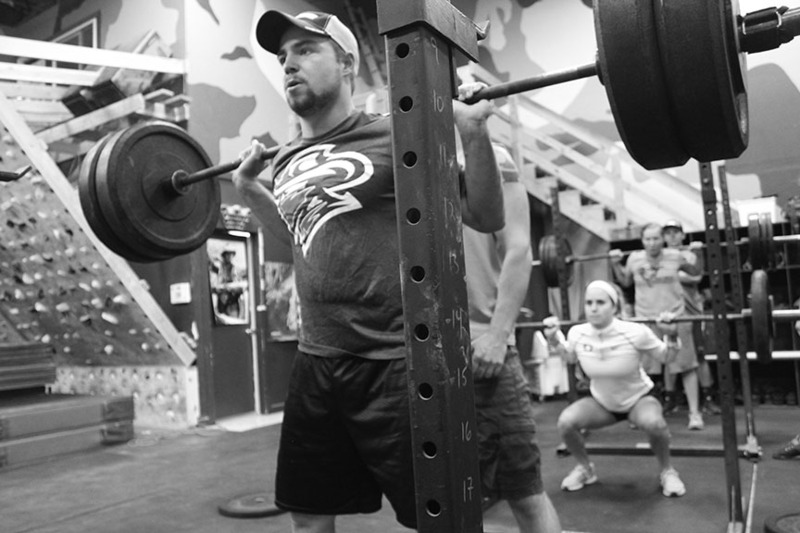 The sled push-based work capacity efforts and endurance work the athletes concurrently completed this cycle could have retarded strength gains from the Super Squat progressions. However, when deployed in our fluid periodization cycles, the Super Squat progression is just the strength part of a multi-modal cycle which typically includes work capacity, chassis integrity, and endurance. Most likely, the reason for the lower results comes from the high “training age” of the athletes in this study. All the athletes in this mini-study were veteran MTI Lab Rats, with high “training ages.” In general, athletes with high training ages have strength levels at or near their genetic potential, and therefore have less room to improve than athletes with lower training ages – or training experience. Bodi, from the chart above, separated his shoulder the weekend before re-assessment and had to pull from the bench press 1RM. This is the second Mini-Study of one of MTI’s free-weight based strength progressions. In a previous Mini-Study, our Big 24 Strength Progression achieved an average 8% strength gain across three classic barbell strength exercises with veteran MTI lab rats. We’ll conduct similar mini-studies on MTI’s five other strength progressions and compare the results across the board. This could perhaps identify which of MTI’s seven strength progressions is the most effective for experienced athletes.